A series of walking maps will be developed by the Falmouth Preservation Alliance that will eventually cover all 8 Villages of Falmouth. The goal of these maps is to stimulate pride and appreciation for Falmouth’s rich history. 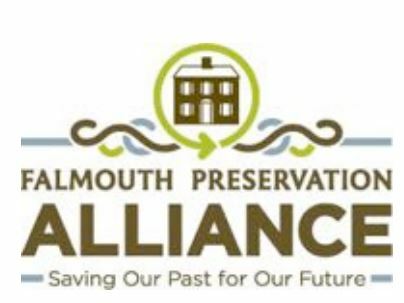 The first map will cover a 2-mile walkable area of downtown Falmouth and will feature cultural resources such as the original stone dock of the first harbor, heritage landscapes such as ponds & marshes, as well as many historic residential and commercial buildings that evoke events, occupations and economies over the past 325+ years. To further enrich the visitor experience, historic markers will be added to this route. Each marker will contain an historic photo and description about the site selected and its significance to Falmouth’s heritage. The heritage trail maps will be available at key sites in Falmouth such as the Falmouth Chamber of Commerce, Highfield Hall and the Falmouth Historical Society, publicized at all lodgings in town and distributed at hospitality conferences to invite guests to visit.